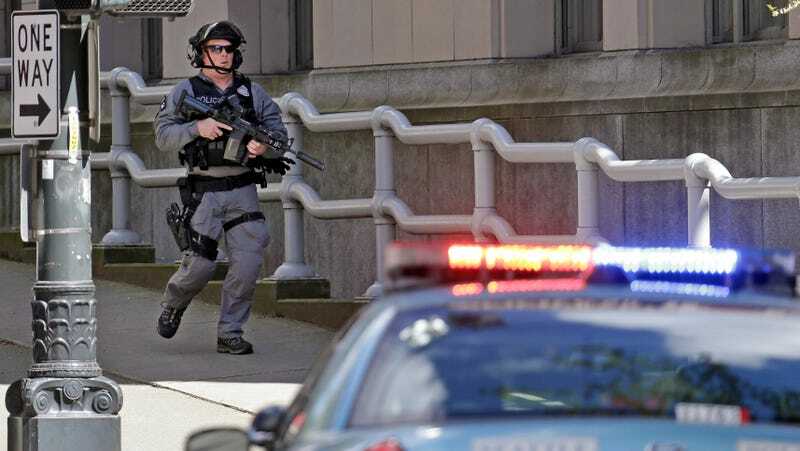 A Seattle police officer responding amid the shooting of several officers in the city’s downtown on April 20th, 2017. The Seattle Police Department launched a program this week to let the public notify them they could be potential victims of a “swatting” hoax, according to Ars Technica. Swatting is a crime in which a malicious party deceives police into thinking a dangerous situation is developing at someone else’s address in the hopes that officers will carry out their grudges for them. Many cases have involved streamers or online personalities whose enemies, or just random jerks, want to harass them. Other targets of swatting have included mass shooting survivor David Hogg, whose Parkland, Florida home was surrounded by officers and a police helicopter over a hoax in June 2018 while he was in DC to accept the RFK Human Rights award. SPD’s process asks citizens to create a profile on a third-party data-management service called Rave Facility (run by the company Smart911). Though this service is advertised for public locations and businesses, it supports private residences as well, and SPD offers steps to input data and add a “swatting concerns” tab to your profile. The anti-swatting system does not amount to a get-out-of-jail free card: The SPD wrote that first responders will still carry out a response to the call, just with more context on what to expect when they get there. In theory, that should give officers a heads-up that the potential hostage situation, gunman, or whatever else a swatter calls in could be a hoax. Hopefully this works, though any long-term solution to unnecessary officer-involved violence on the national level will more likely depend on meaningful reform of police departments themselves. Currently, it’s dubious that trend is headed in the right direction.